Suppose you want to programmatically access SharePoint Online from Node.js, Ruby, Java, [insert your favorite platform here],…. 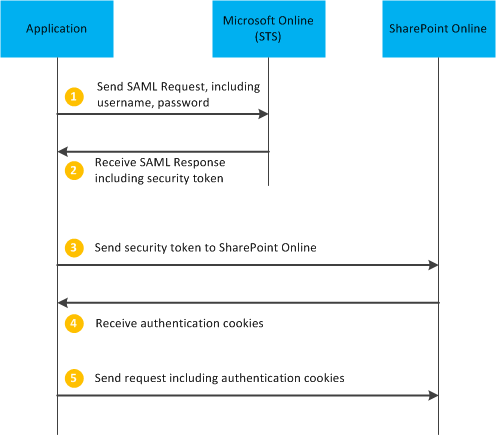 SharePoint offers data access APIs, but how do you authenticate? SharePoint Online uses claims based authentication. Documentation about programmatic authentication is fairly limited and restricted to .NET solutions. Fortunately there is this great post from Wictor Wilén, providing a working .NET example that connects to SharePoint Online. It requires the SharePoint Client Object Model and Windows Identity Foundation SDK and Runtime (WIF) to run. Fiddler to the rescue! By running the sample application and using Fiddler to look at the http traffic under the hood, we can find out how the authentication sequence works. The Request Security Token message should contain username, password of a Microsoft Live account and the url of your SPO site. Here is a template that you can use to build the XML message. Extract the token value (including ‘t=’) for the next step. After SPO has validated the Security Token, it will return 2 authentication cookies in the HTTP header: FedAuth and rtFa. Extract the values of both cookies. This will satisfy SPO to process your request, whether it is a request for a page, a document, a web service or ListData service. So if you are in for some exposure to cutting edge technologies, read on! SAP Gateway is a SAP server add-on that allows you to access business data in SAP systems through OData, an open web protocol for querying and updating data, built on common web technologies like HTTP, XML and REST. Cloud9 is a web-based IDE + node.js runtime environment offered as a service (partially open sourced). 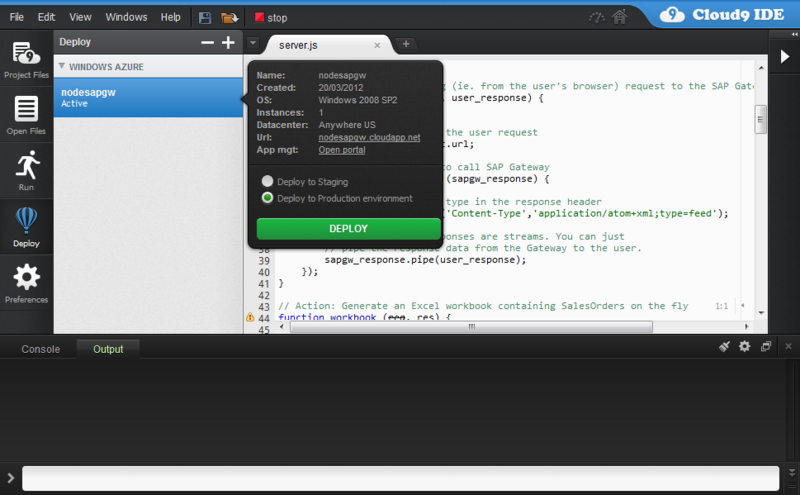 In Cloud9 you can develop, debug and test node.js applications, all from within your browser. Cloud9 can use a GitHub repository to manage and share the source code. 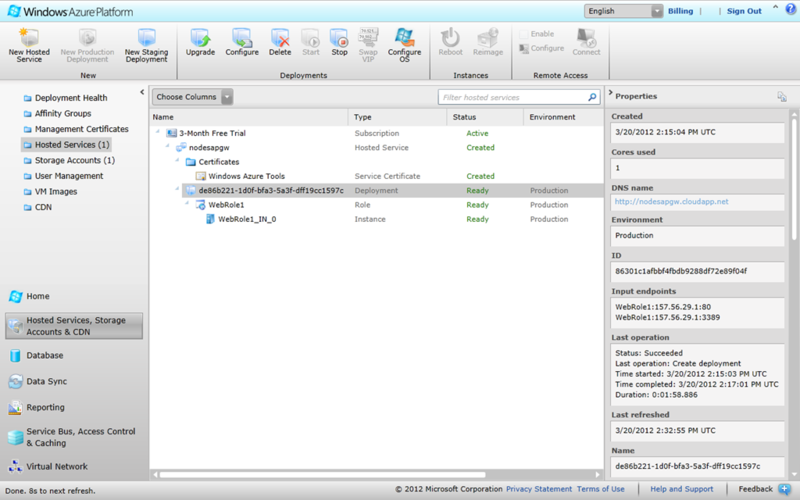 Once you have completed your application, you can deploy the application to Windows Azure. Windows Azure is Microsoft’s cloud platform. One of the services is hosting a Node.js application in a scalable environment. GitHub hosts source code repositories,using the Git version control system. GitHub offers public and private repositories. To work with GitHub, you need to use Git client software. For development, we’ll create a code repository on GitHub. 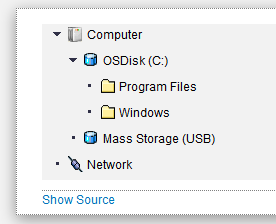 This way we can add/update source code and resource files both from our local machine (via Git) and on Cloud9. 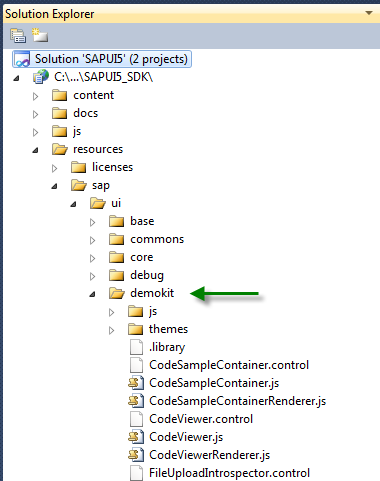 We will use the repository to add all SAPUI5 js and css files that are required to our project files. In Cloud9 we use a clone of the GitHub repository. This way we can push and pull Cloud9 project files in and out of the GitHub repository. Cloud9 is a fully web-based development environment: developers use a browser to access the Cloud9 code editor, system command prompt, debugger, Node.js console output etc. We can run a Node.js application directly on the Cloud9 environment and use a special url to access the running server app as a (test) user. the server sends the client application html file (index.html) which instructs the browser to load additional SAPUI5 resource files and the client js code. 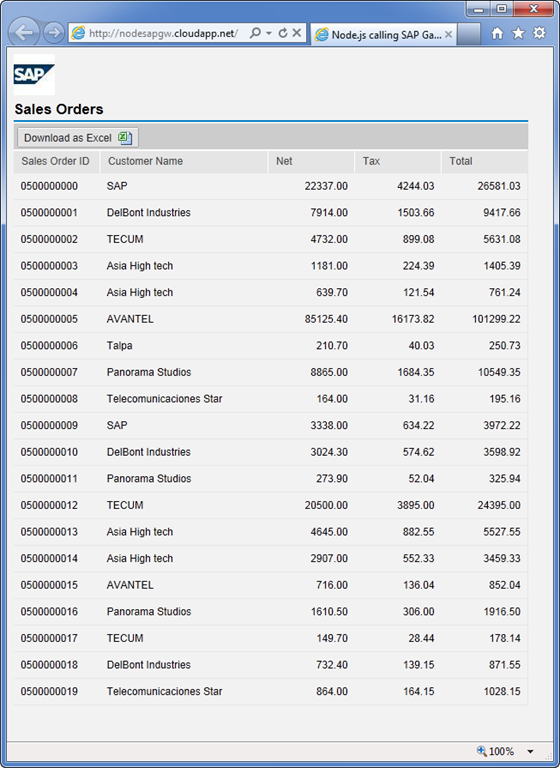 the client app starts up and creates a SAPUI5 OData Model and Data Table to fetch and display Sales Order data. The data isn’t fetched from the SAP Gateway directly (not allowed due to the Same Origin Policy). Instead, the request is sent to the server, which forwards it to SAP Gateway. The server acts as a reverse proxy. 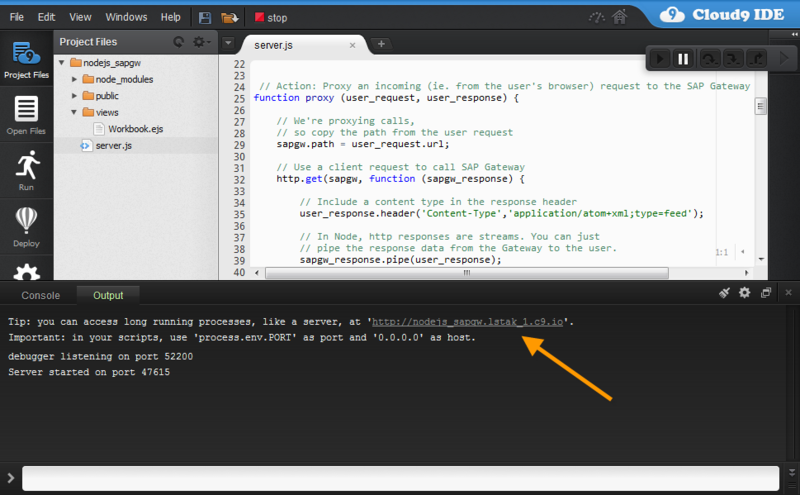 The server passes the OData response from SAP Gateway to the browser. 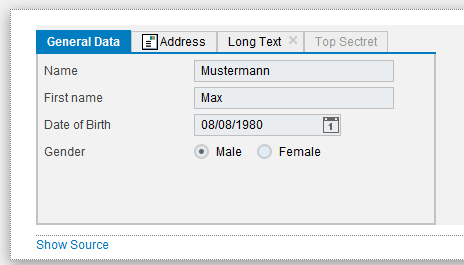 Here, the OData feed is parsed using SAPUI5’s built in OData support and the extracted data is shown in the Data Table. When the user clicks on ‘Download as Excel’ button, the client app requests a special url from the server. This will trigger the server to fetch the Sales Order data from SAP Gateway, parse it (but now on the server side! 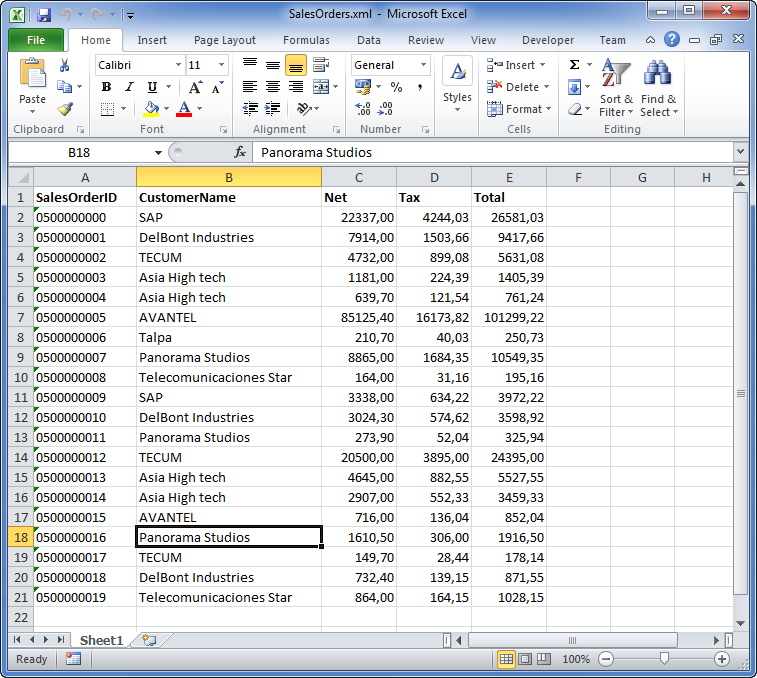 ), convert it into an Excel format and return this to the user. The user experience is identical to requesting a downloadable file. 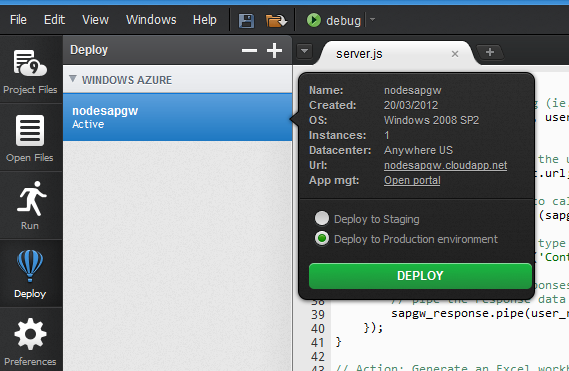 Once we have the application working in the Cloud9 environment, we can request deployment to Windows Azure. 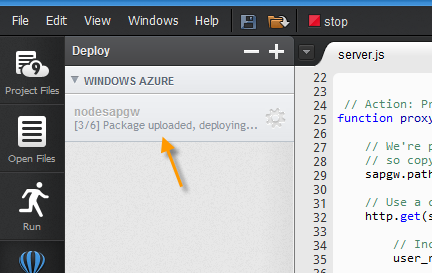 Cloud9 will generate configuration files, package the apps, upload and deploy to Azure. This demo project involves quite some platforms and services. Within the scope of this blog post it is not feasible to provide a very detailed, click-by-click walk-through. Instead I will refer to tutorials for the respective services which contain detailed instructions and I will point out the main route and highlights along the way. I recommend that you use Safari, Chrome or Firefox on GitHub and Cloud9. IE support is lagging (GitHub) or non-existent (Cloud9). First we need to create a repository on GitHub to manage and share our source code across environments. Sign-up with a (free) account for GitHub. A free account let’s you create public repositories. I think GitHub is a great tool for developers, so I encourage you to check out the GitHub help center to learn more.about the other features of Git and GitHub. For our demo project the above commands are all we need. Now we have a repository on GitHub, we can start a project on the Cloud9 IDE. Signup on http://c9.io. It is very convenient to signup with your GitHub account. Look for the small GitHub icon. 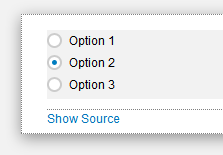 Select the repository and click ‘Clone to edit’ and select Shared Development server. The Cloud9 environment will make a Clone of the GitHub repository available in your Cloud9 environment. Once the Clone is completed, you see the following screen. Click on ‘Start Editing’. This will bring you into the project environment. Create a folder called ‘Public’. This folder will contain all the files required for the client application. Add the index.html and app.js (described below) and push the changes to GitHub and pull to your local machine. Add the SAPUI5 resources on your local working directory and push to GitHub and pull from Cloud9. All this pushing and pulling sounds like a workout, but trust me, you’ll get the hang of it! 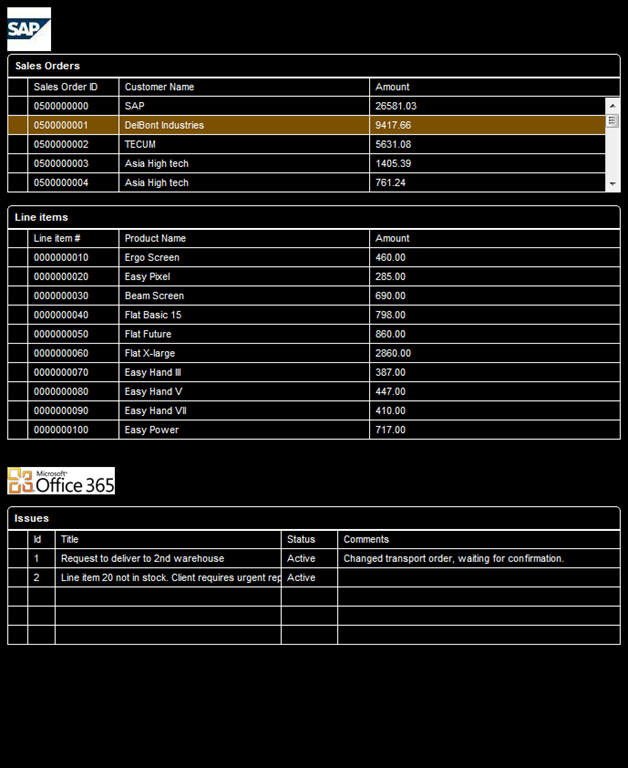 The client application consists of an index.html file and app.js file and uses SAPUI5 to fetch and parse OData and render a data table widget. The index.html includes the SAPUI5 core library (which dynamically will load all dependencies), the application js file and a placeholder for the data table. 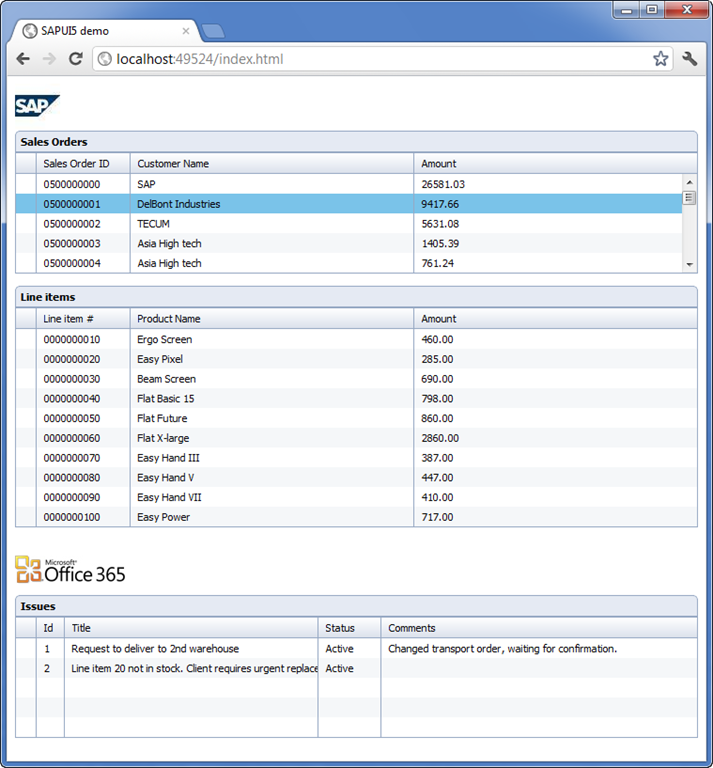 // Specify the SAP Gateway SalesOrder service as an OData model. // This way, we comply with Same Origin Policy of the browser. // will return the sales orders. // Each sales order should result in a table row. // Put table in the DOM. // DOM is not ready yet (like in this demo). With that, our client application is in place. Node.js includes core library functions to create an HTTP server and client. You have probably seen the famous 6 lines of code to create a ‘Hello world’ http server in Node.js. The core library is intentionally kept light-weight and (relatively) low-level. But is very easy to extend the base capabilities of Node by including modules in your code. The Node.js community has built a wide range of modules that handle common tasks like XML parsing, static file serving, request routing etc. express.js: a web application framework on top of Node, to provide request routing (connecting incoming requests to JS functions) and serving the static files (the html, js and css files for the client application). 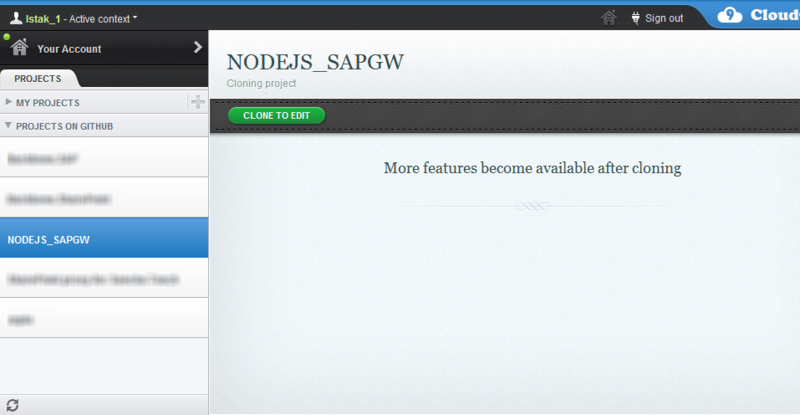 This will install the modules (and their dependencies) in the node_modules folder of your Cloud9 project. Click the refresh button next to Project Files and you can see the results. // get the username/password from the SCN page. // pipe the response data from the Gateway to the user. 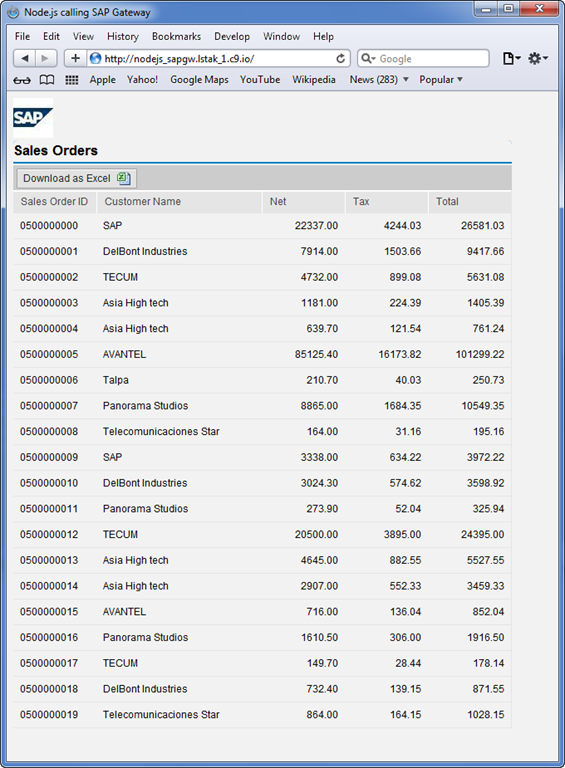 // Kick-off by fetching the SalesOrderCollection..
// from SAP Gateway, the 'data' event fires. // so we need to do that explicitly. // The 'end' event fires when the parser is done. // The resulting JS object is passed as parameter. // of the parsed XML string. // representing 's in the XML string. // and render the Workbook. You can find the username/password for the SAP Gateway demo environment on this SCN page. Now, let’s run the application in debugging mode on Cloud9. The Output tab will show the output from the application initialization and any console.log statements you include in the code. It also provides the url where you can access the running application. OK, we now have a working application in Cloud9! There’s a lot more to explore in the IDE. For example, try the debugging options: you can set breakpoints, just like in desktop IDEs. Code execution on remote server will halt and you can explore variable and parameter values, etc. You can also push your changes to the central repository on GitHub. Here, we will continue our Quick Tour by deploying the application we just completed to Windows Azure. 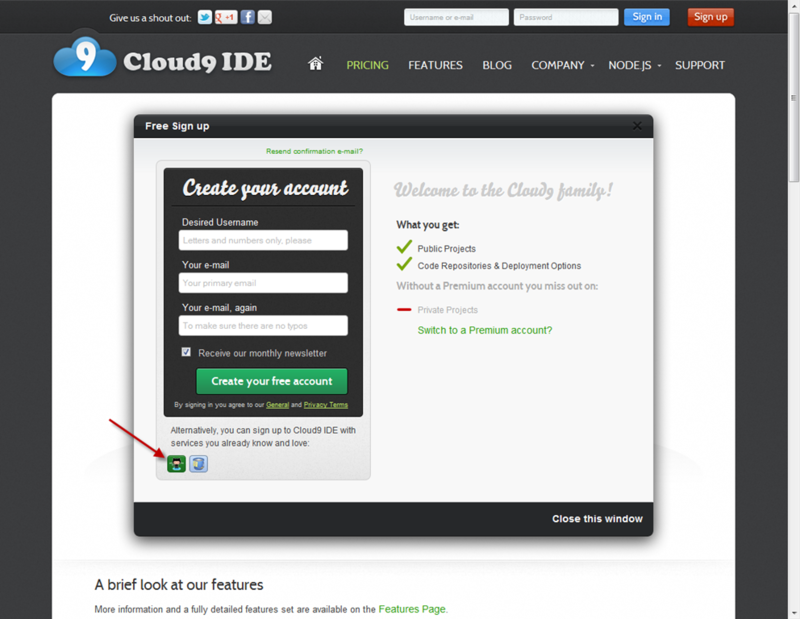 Cloud9 makes deployment to Windows Azure very easy. This tutorial shows all the steps in detail. You can skip the first steps because we already have a working app on Cloud9. Please start at “Create a Windows Azure account’. Cloud9 will offer to create default configuration files for you. Please accept. You can try it! It’s live. You’ll notice that it takes quite some time to load the page. This is mainly caused by dynamic loading of SAPUI5 resource files. Optimizations are certainly possible, but outside the scope of this article. 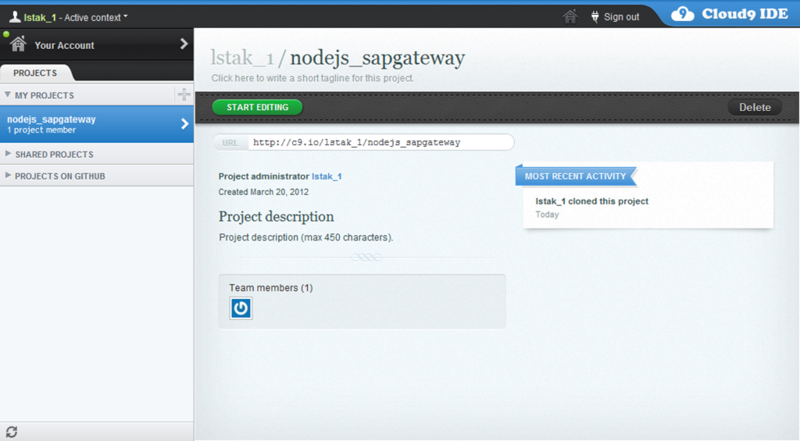 This concludes our demo project to show how you can front-end SAP Gateway using Node.js on Azure. Provide access to multiple backend systems through a single domain (origin). This way, you comply with the Same Origin Policy. Offload non-business data http traffic of SAP Gateway to a more cost-effective platform. Protocol conversion: you may want to build client applications using other protocols (e.g. WebSockets) to expose business data. E.g. consider real-time auctions. Identity conversion: a consumer facing web application may allow consumers to login with their Facebook or Twitter account using OAuth2. The web application server can connect to SAP Gateway with a functional account. Let me know if you have other suggestions/use cases. 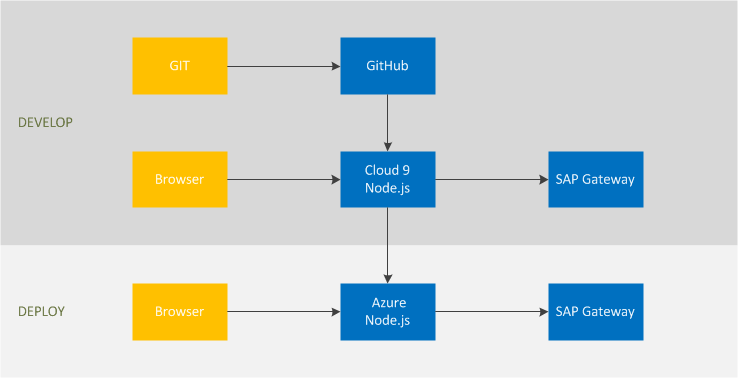 Getting started with Node.js Web Application: describes a local development approach for Node.js apps on Azure using the Windows Azure SDK for Node.js. 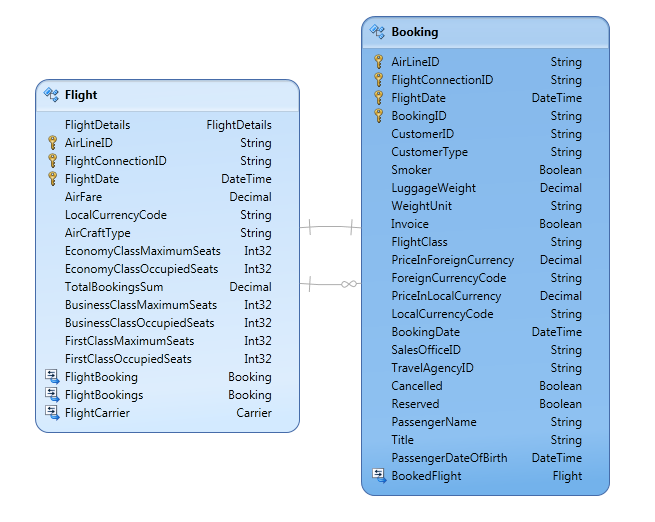 SAP NetWeaver Gateway OData services can contain a comprehensive set of entity types and associations. 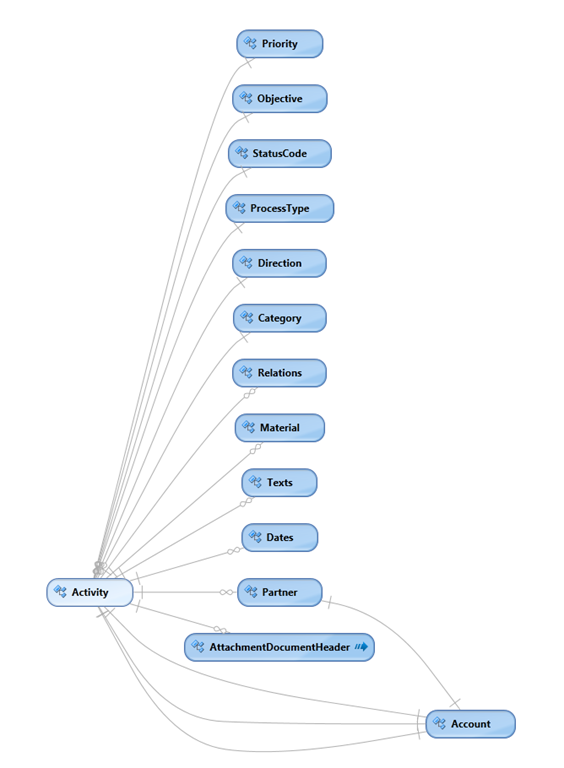 A visual representation can help you understand and communicate the contents of a SAP Gateway OData service. 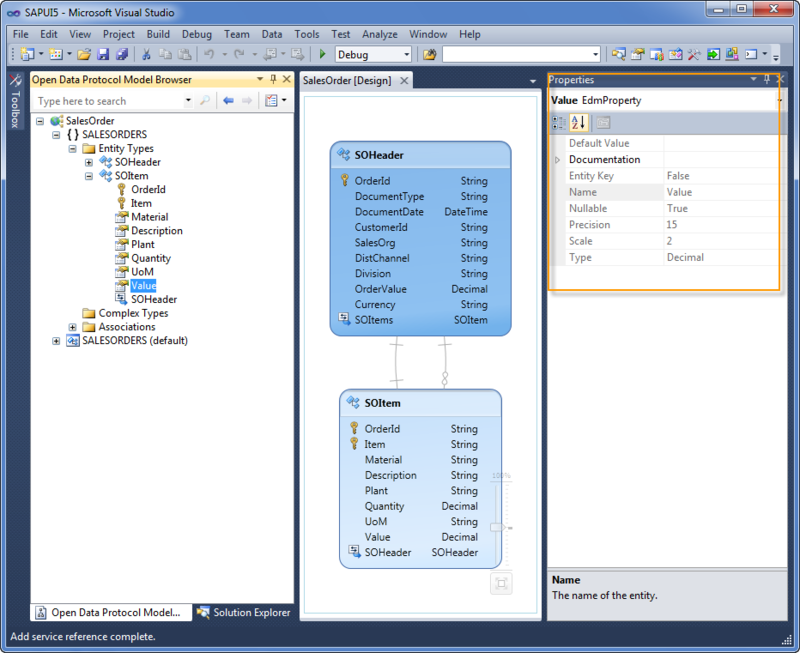 In this post I will describe how you can explore SAP Gateway OData services, using the Open Data Protocol Visualizer, a free extension for Visual Studio 2010. 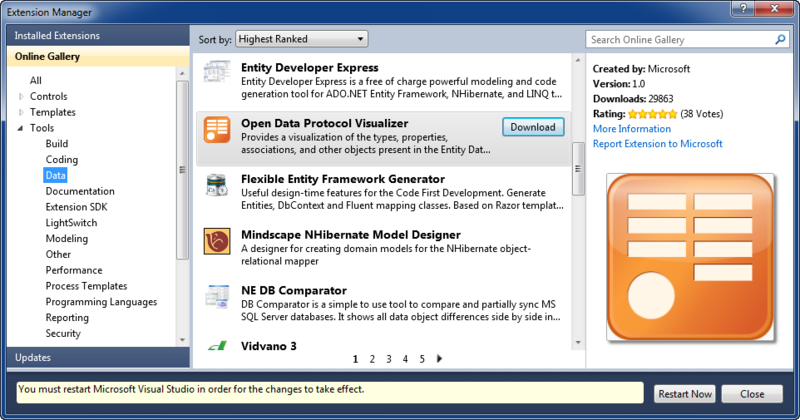 The Open Data Protocol Visualizer is a Visual Studio 2010 extension, which you can install via the Extension manager. 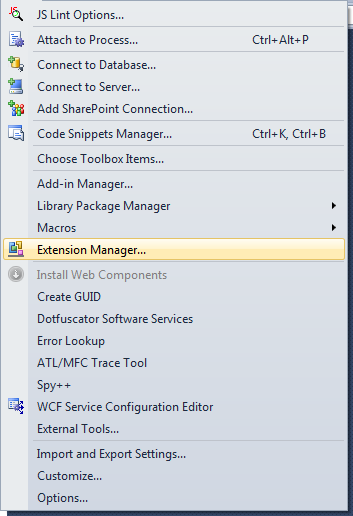 Launch the “Extension Manager” from the Visual Studio “Tools” menu. Click to download and install. Restart Visual Studio and you’re done! 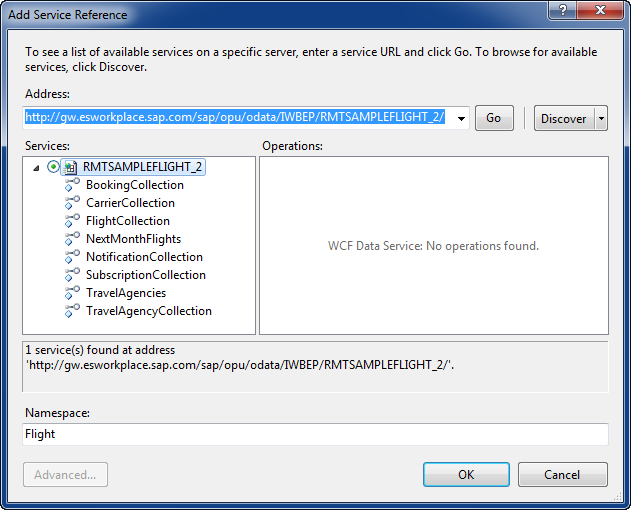 Let’s use the ubiquitous Flight service on the SAP Gateway demo system as an example. You will need the demo username/password, provided on this page. In the dialog box, enter the service Url in the Address field and provide a meaningful name in the Namespace field. 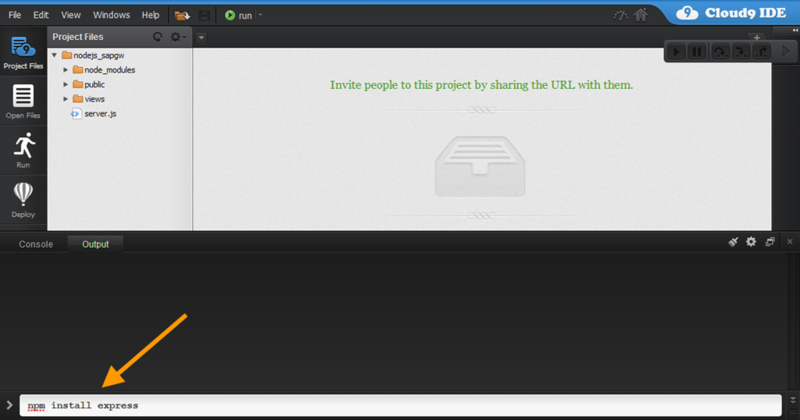 Click on Go and provide the demo username and password. Visual Studio will now download the service information ($metadata). Once completed, you should now be able to expand the Service header and see the collections available through the Flight service. This opens the visualizer window. In the left pane, you will find a model browser, which lists Entity types, Associations, Complex Types and their Attributes. The center pane contains a ‘canvas’ where you select and layout the visual representation of the model. zoom in/out: canvas can be zoomed in and out. view in browser: automatically open the collection for a selected Entity type. E.g. View ‘Booking’ in browser will request the BookingCollection from the Flight service. export to XPS: export the content to XPS file format (unfortunately no other file format is supported…). Finally, here’s an example of the properties pane showing the attribute properties of the Value attribute of a Sales Order Item. 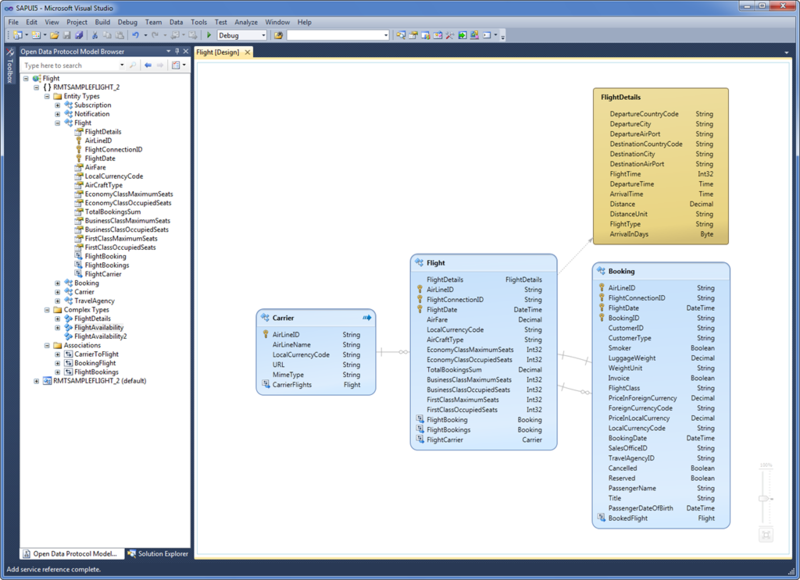 The OData visualizer can be a valuable part of your toolbox. Give it a try! 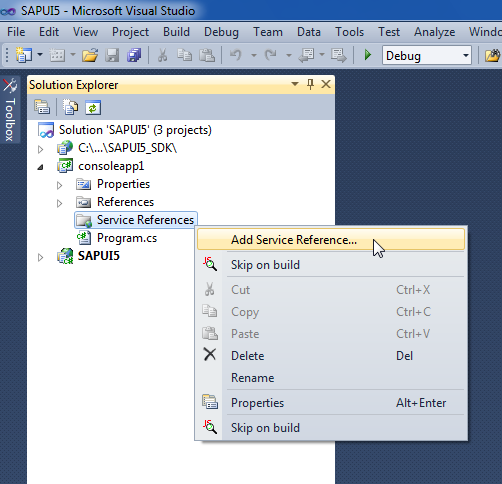 My previous post “Getting started with SAPUI5” provides the steps required to get the SAPUI5 SDK documentation installed and ready for use on your local machine using Visual Studio. 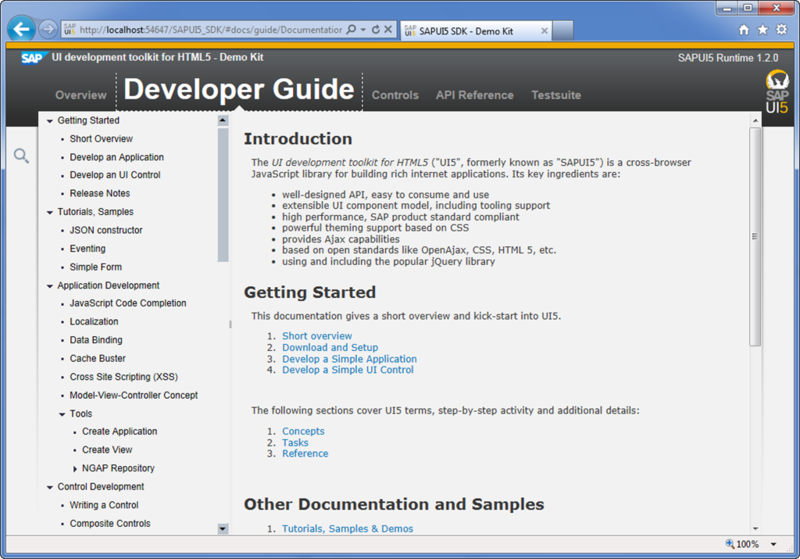 The SAPUI5 SDK documentation also includes lots of live code samples. To get them up and running requires some additional steps. 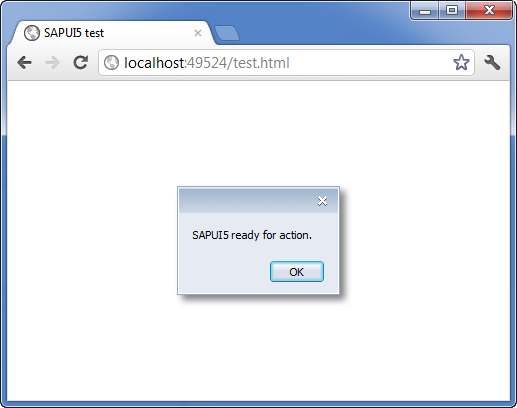 The SDK samples provide a good impression of the look & feel of the SAPUI5 controls. 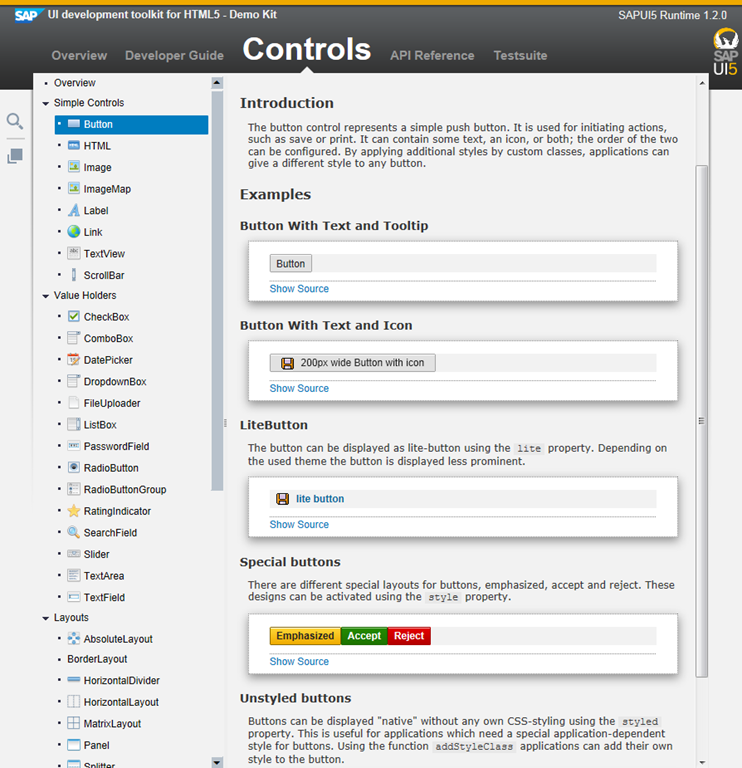 The screenshots below show some of the available SAPUI5 Controls (using the “gold reflection” theme). For more information, visit the SAPUI5 SDK developer center on SDN. There are some great HTML5 UI frameworks available in the marketplace: Sencha Touch, KendoUI and Twitter Bootstrap to name just a few. 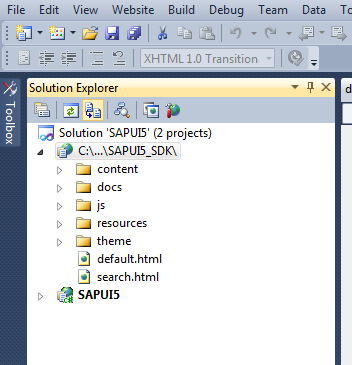 And now SAP has unveiled the Beta version of SAPUI5, officially known as “UI development toolkit for HTML5”. As a follow up on my post on Building a SAP mobile app with Sencha Touch 2, I was keen on having a hands-on with SAPUI5. These helpful posts helped me to get started. 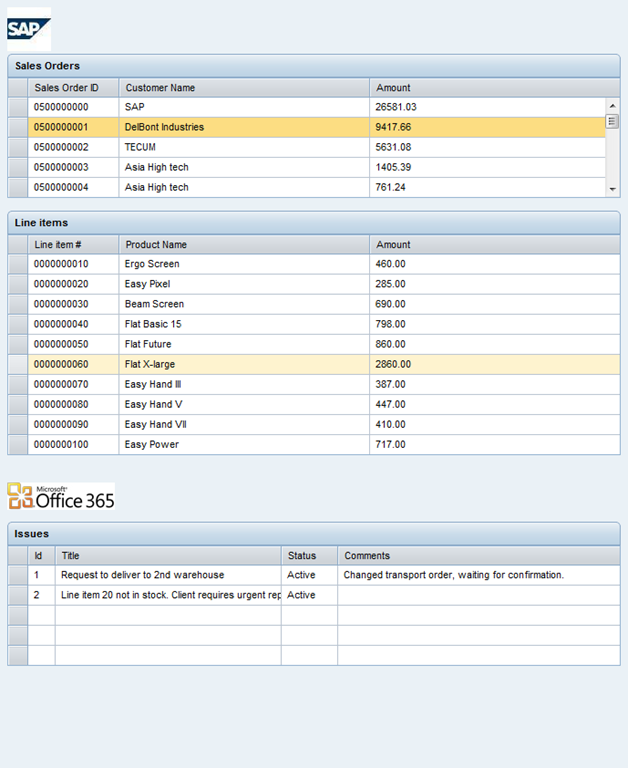 In this post we’ll set up the Beta version of SAPUI5 for use in Visual Studio and create a demo SAPUI5 app that fetches SAP ERP Sales Orders from SAP Gateway and combines them with issues tracked in a SharePoint list. Rename demokit.war to demokit.zip and unzip. This archive contains the documentation which you can install locally. Rename index.html to default.html (the VS dev server opens default.html instead of index.html when browsing a directory). Now we have the documentation up and running, we create our first test to see if we have all the required files. The test.html file instructs the browser to load the sap-ui-core.js file which contains jQuery and also a dynamic loader which will load further required js and css files. To show that everything loads correctly, we simply create an alert box (one of the SAPUI5 controls) when the DOM is ready. OK, we’re all set to do something a little more exciting! Consider the following business scenario: a company is managing Sales Orders in SAP ERP. 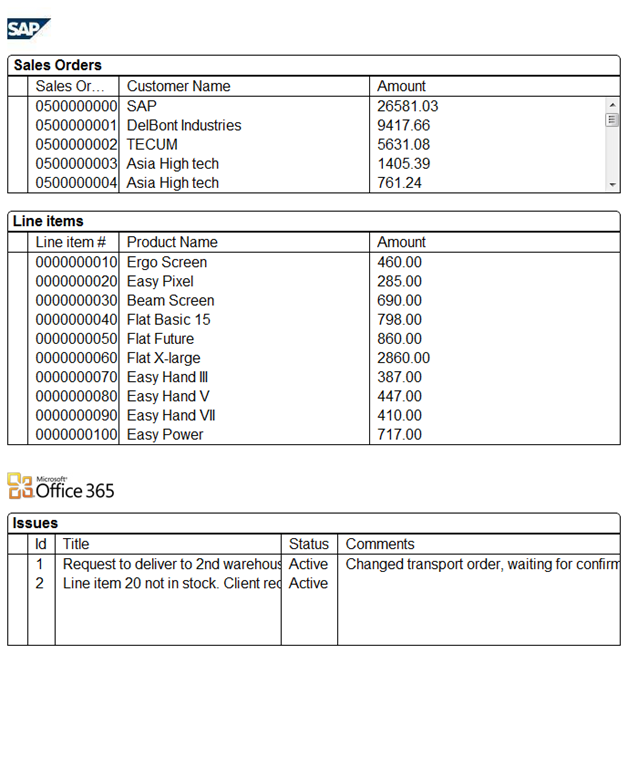 To improve order fulfillment, they use a issue tracking workflow system in SharePoint. Their requirement is to see the info from SAP and SharePoint in a single screen. Let’s build that with SAPUI5! We will connect to the online SAP Gateway demo system to fetch Sales Orders from SAP ERP. Using the demo SAP Gateway system, you can try out SAPUI5 without having to install/configure any server side components. 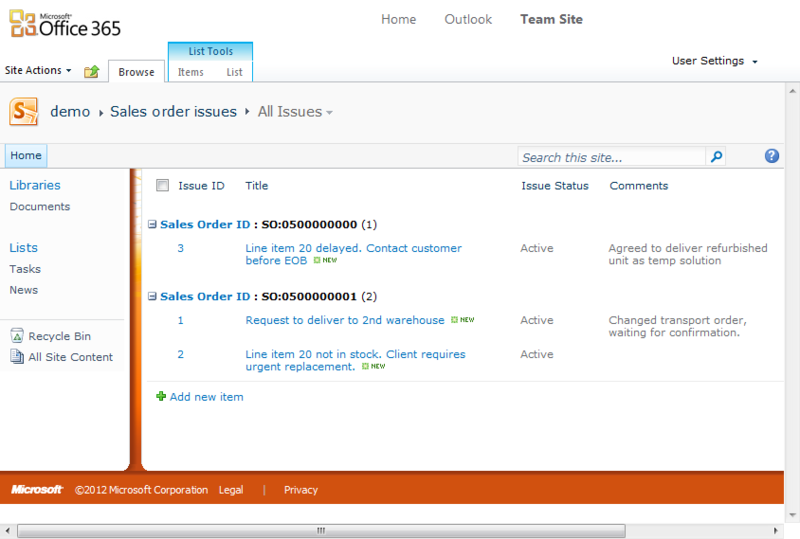 Issues: a details table showing the issues tracked in SharePoint related to the selected Sales Order. // get the username/password from the SDN page. // The three data tables are ready! We have just build our first mash-up of SAP ERP and SharePoint data using SAPUI5! Huge code base. Definitely not a micro-framework . Amazingly little code is required to get a demo app with OData sources described above up and running. Style and idiom is a bit verbose and seems to be influenced by Java. This may be a pro or a con, depending on where you are coming from. Overall SAPUI5 is a very interesting entrant in the marketplace and sure to further boost the position as HTML5 as UI platform. 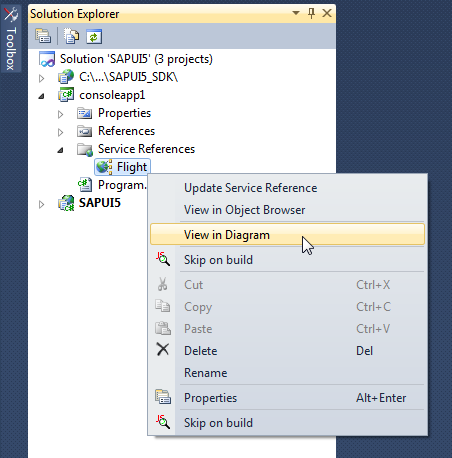 I hope this post is helpful in starting to explore the SAPUI5 Beta yourself. 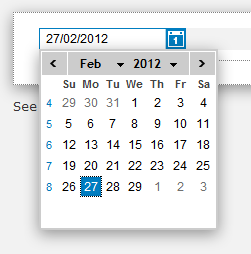 UPDATE (Oct 2012): SAPUI5 now includes mobile controls. See comment below from Ruben. This blog is provided by Luc Stakenborg. I am an IT consultant/developer with a passion for (mobile) web apps and integration with back-ends such as SharePoint. I run a web development company called Oxida, offering design and development services.